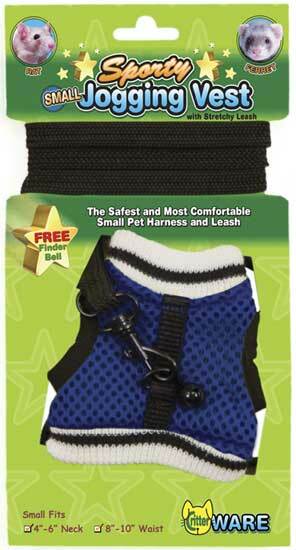 Home :: Small Animal :: Leashes :: Walk-N-Vest Leashes by Ware Mfg. Walk-N-Vest Leashes by Ware Mfg. The safest and most comfortable way to "hook-up" your critters. The EZ on vest with its velcro fasteners holds your furry friend securely and comfortably, the leash allows you to guide your critter safely. *Small fits Baby Ferrets, Pet Rats, and Other small critters. *Medium fits Female Ferrets, Guinea Pigs, and Dwarf Rabbits. *Large fits Adult Ferrets, Rabbits, and other Pets. *X-Large fits Big Bunnies, Cats, and some small Dogs. Notify me of updates to Walk-N-Vest Leashes by Ware Mfg.